When you’ve got a steady stream of promotions for events, attractions, and travel specials to manage, you’ve got to be efficient in your social media tactics. Whether you’re a large city’s visitor bureau, a local hiking and biking trail system, or an independent, eclectic movie theatre, you’ve got to keep a steady drum beat of information, specials, and promotions running. 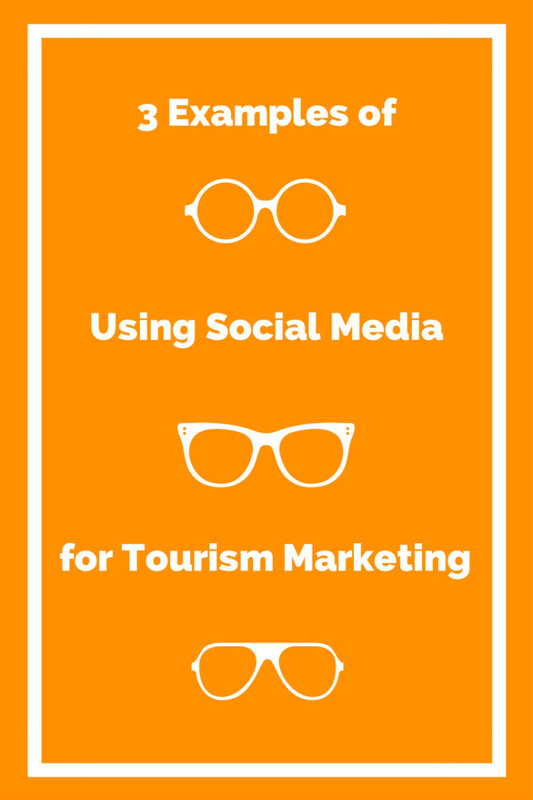 When using social media for tourism marketing, it can be quite a challenge to keep your social media networks active and engaged. Here’s a few examples of how business owners and social media managers stay efficient in their social media activities. Dan Fuoco manages tourism marketing campaigns on social media for Visit Detroit, with the mission of getting both consumers and businesses to visit Detroit for conventions and leisure travel. With 4-5 social media campaigns running at any point in time, Dan keeps busy making sure all events and promotions are getting the posting frequency and visibility each deserves. Rignite’s Campaigns module makes it easy for Dan to schedule a series of posts for each campaign and to track results. The wizard takes him through setting up the series, frequency of posting, base post messages to rotate, and even will automatically insert Google Analytics tracking parameters. 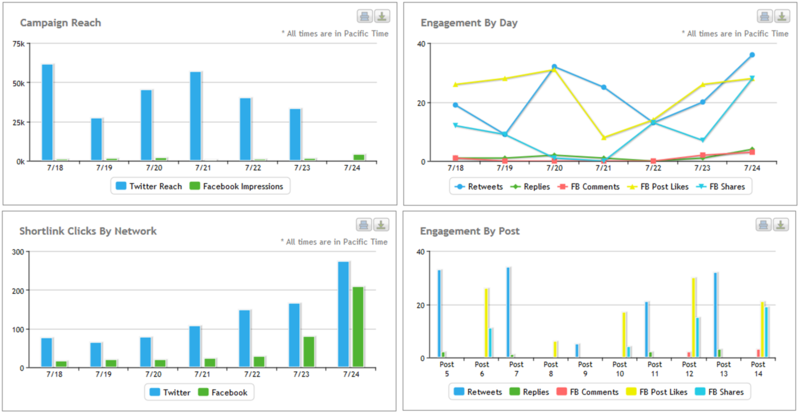 The Schedule then makes it easy to see all posts for all campaigns in one view to ensure an even flow of posts. If posts overlap, it’s easy for Dan to drag and drop them to another day or edit them for a different time. You can plan ahead by scheduling tons of posts that will go out months from when you originally scheduled them. The best part is that it only takes a few minutes – try scheduling in our Campaigns module today! With Campaign level analytics Dan is able to see which series is getting the best reach and engagement. This one from the Detroit Birthday Tweetup was huge, getting a reach on Twitter of over 260,000 and impressions on Facebook over 11,000, without any ad driven boosts! Building on that success, the 5 Media Outlets campaign currently running looks like it will overtake the Twitter reach of the Birthday Tweetup (see screenshot below). With Rignite Campaigns, it’s easy for Dan to schedule anywhere from 2 to 10 posts per day and a total of 15 to 60 posts for the duration of the campaign, with rotating messages to keep fans engaged. 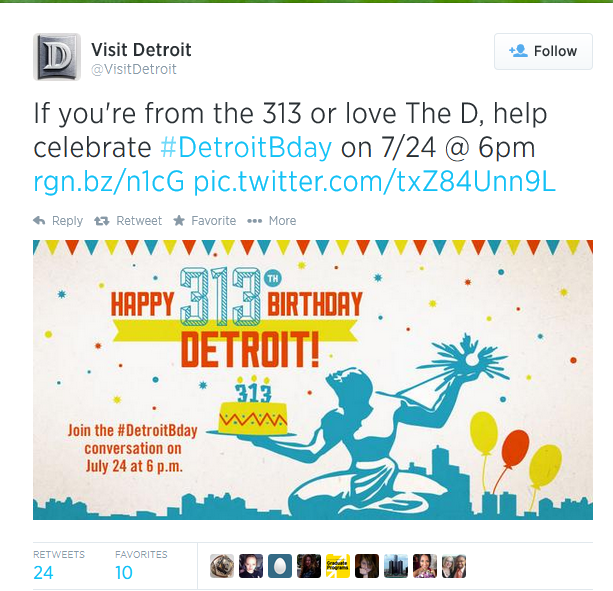 It’s no wonder the campaign analytics are able to show tremendous reach, impressions and engagement for Visit Detroit. Here’s a snapshot of the Detroit Birthday Tweetup campaign analytics. You can see above that it’s useful to see analytics on the entire series of posts as well as by each individual post in a campaign. Ike Rebout manage’s social media for tourism marketing at this chamber of commerce, which focuses on a diverse range of activities in the area. These include economic development, community outreach, and tourism. From Golf outings to business events, this creates a unique challenge for managing what gets posted on each social media channel. There are 7 facebook pages, 2 Twitter pages, and 2 LinkedIn pages being managed through Rignite. In order to grab the attention of fans, Ike leverages the powerful visual imagery available from the destinations around Sparta. 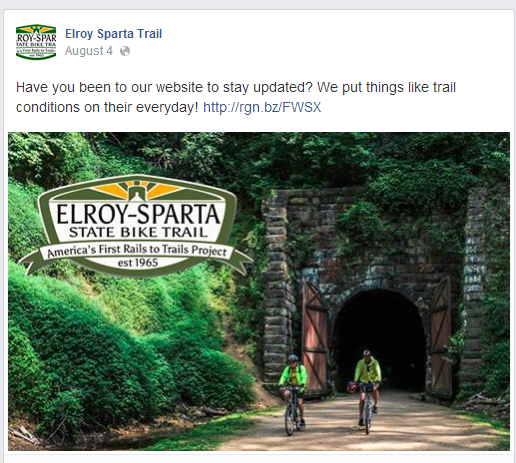 The Elroy Sparta Trail has both great imagery as well as a unique story. 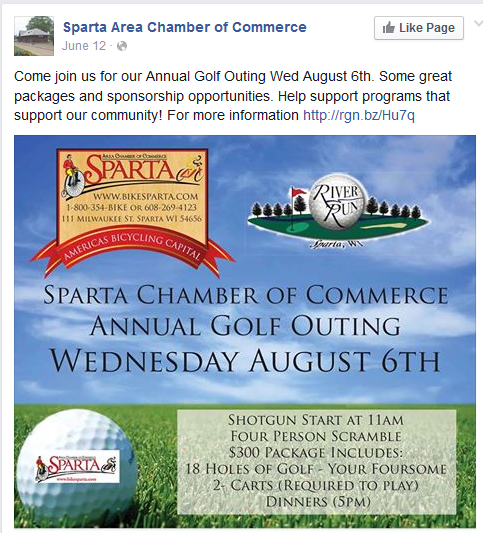 Events such as the Annual Golf Outing are also popular activities being promoted by the Sparta Area Chamber of Commerce. “Our goal was to find a social media platform that allowed me to have a life instead of my life revolving around our social media channels. Rignite was the perfect solution with the ability to run campaigns, schedule posts, and monitor keywords that are relevant to our organization. The Golf Outing campaign had content that wasn’t going to change daily. However, we needed to keep reminding our members to sign up. It saved us easily an hour or two by being able to create one campaign, then move on to our next projects. Organizing posts into Campaigns helps Ike keep track of each promotion separately to make sure that each campaign is customized for the social networks selected, campaign length, day and time of postings, and other critical factors. You’ll never have to worry about losing your fans attention when you’re scheduling posts through campaigns. Engagement comes easy when you schedule in advance using Rignite! 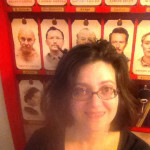 Paula Guthat is the co-owner and founder of Cinema Detroit, an independent theatre delivering a quirky and quality mix of contemporary, indie, cult, genre, and classic movies in the heart of the city. With a business to run and no time to waste, their social media activities need to bring attention and enthusiasm to their lineup. Our schedule feature makes it easy to see which days in your week need more posts, and which might need less. You can drag-and-drop posts from the heavier days to the lighter, and create a steady stream of content. Paula is able to efficiently schedule a campaign for each new movie using the campaign “Schedule a Series of Posts” in Rignite. This enables her to schedule a rotating series of several posts across her Facebook and Twitter networks for multiple days or weeks. With the Campaign Dashboard Paula is easily able to see current and past campaigns and see which ones generated with most interest. In many ways, this reflects which movies were more popular, but it can also reflect how each movie was promoted in the campaign posts. 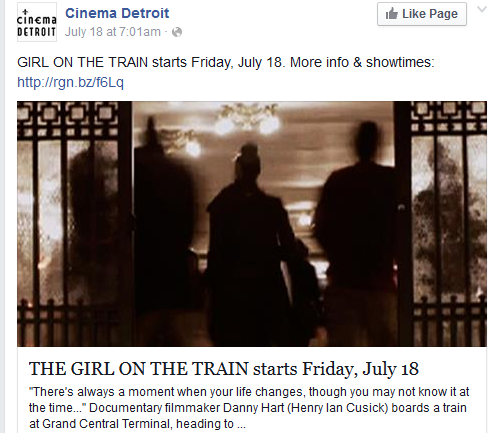 Going forward, Paula would like to experiment with a few Facebook and Twitter giveaways to boost engagement on Cinema Detroit’s social networks. Run campaigns, monitor and engage with your audience, and become a social media rockstar with Rignite. Sign up for your free trial!